All the pro-gun authors are sending out their books for review. I received another today "Assault on Weapons" by Alan Gottleib of the SAF. This one is a fiction story written by blogger Steve Wright. Just finished it a little while ago. Honest review time. Overall well written. 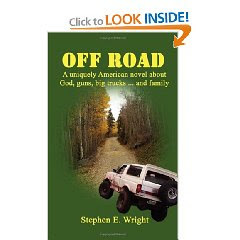 I liked the characters and the setting even though I'm not into off-roading but do love camping. I read a LOT so I was able to foreshadow most of the story fairly early but it still kept me involved. I'm man enough to admit I got a little blurry during some of the it. I'm not religious so it was a bit 'preachy' for me at times. I enjoyed it. I've lent it to a friend of mine to read over the holidays. Looking forward to Part II. *Disclaimer: I did receive the book for free for review. The author is a friend of mine. Thanks again for taking the time to give my book a read and review!